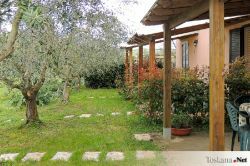 The farmstay Borgognano Farm House is situated in a splendid hilly position in the countryside a few kilometres from the medieval town of Massa Marittima (12 km) and from the characteristic village of Suvereto (17 Km) near the splendid Gulf of Follonica (15 km) in Maremma Toscana. 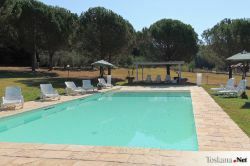 There are 4 apartments for 2 up to 5 persons available, each with own private outside space, 2 double rooms with private bath inside of the farmhouse and a huge garden with beautiful panoramic swimming pool. The swimming pool is the center of the farmstay for our small and adult guests, exposed during whole day round towards the sun and in the evening it is possible to enjoy from here unforgettable sunsets. The lights around the pool during the night will accompany pleasant moments of relax after dinner on the terrace. At disposal there are in the garden several toys such as slide, a swing, sun beds and deck chairs as well as a barbecue to grill fish or meat. Here at Borgognano Farm House in the open countryside of Maremma Tuscany, you are far way from noise and during the day, the only sound you will hear is the chirping of birds and the singing of cicadas, whereas in the evening you will enjoy the luxury of silence. 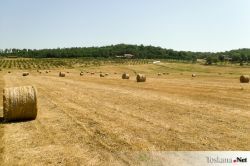 As Borgognano is surrounded by the Mediterranean macchia wood, it is possible to view wild boars, fallow dears, roe dears, porcupines, hedgehogs, foxes, hawks and tortoises. At the farmstay it is possible to practice riding on the two horses or as an alternative, you can even bring your horses with you on holiday. Your horses will be accommodated in comfortable horse boxes or on the huge farm paddocks next to the farmhouse. 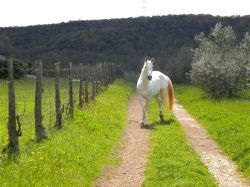 Therefore, also your horses can pass a relaxing holiday in the countryside with you. If you love long walks in the countryside, here inside of the Montioni National Park there are several trails to cover on foot, mountain bike or on horseback. 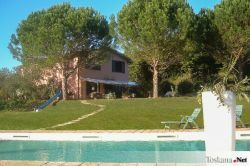 At Borgognano Farm House you can therefore enjoy the peace of the countryside or reach the sea of the Gulf of Follonica only 15 km away. Along the coast there are many places that are worth visiting, such as the exclusive Punta Ala with the kilometre long beach before reaching the yacht harbour, the famous natural bay Cala Violina where the sound produced of the wind with the sand will produce a sound similar to a violin, the romantic Castiglione della Pescaia, or a bit further north Gulf of Baratti where besides the beautiful beach one should visit the archaeologic park with important findings and the small village remaining of the Etruscan Populonia. You may also visit the coast and the islands Elba, Giglio or Capraia with mini cruises starting from the nearby ports of Castiglione della Pescaia, Puntone di Scarlino, Piombino and San Vincenzo. Along the coast there are several nature reserves such as Diaccia Botrona, once marsh and today on of the most important paradises for birds, further south the Parco Naturale della Maremma whereas further north we find the Parks of San Silvestro and Rimigliano. If you love thermal water, you can enjoy the benefits at the spa village Terme di Venturina or a bit more distant Petriolo or Saturnia. From the farmstay Borgognano Farm House it is possible to start for daily excursions in the most famous places in Tuscany such as Siena, Volterra, San Gimignano, Florence, Pisa and Lucca.